Top 10 Things To Do in San Diego Today! One of Point Loma neighborhoods many creative food concepts, Modern Times Fermentorium is a unique location that brings the community both a brewery and coffeehouse. Visitors can select from an impressive panoply of seasonal offerings, classic drafts, and original craft creations. Modern Times offers pleasurable experiences for both beer enthusiasts and those who are only just coming to understand beer for the artistry it can genuinely be. Don’t leave the area without experiencing the brewing culture that makes San Diego one of the top craft beer cities in the country. Not much of a drinker? Patrons can choose from a variety of coffee products brewed from high-quality beans while enjoying; it’s the perfect location where non-drinkers and alike can gather for rest and relaxation. is national park, where coastal tide pools offer up-close glimpses of sea creatures: lobsters, a wide assortment of fish, and the occasional octopus. You can visit this scenic destination for $15.00–the fee required to enter the park, and explore all the natural settings and walking trails this region has to offer. The San Diego Zoo will appeal to all families, regardless of its members ages. When seeking family adventures in San Diego, this destination allows you to get up close and personal with some of the world’s most exotic and rare creatures.There aren’t many places in the world where you can intimately witness the strength of a leopard’s leap from a tall ledge to a resting boulder. Be sure to browse the zoo’s current shows and personal animal experiences here before planning your stay. San Diego’s finest hotspot for parents and children to learn and explore together, is a local attraction for curious minds. Children can partake in workshops and other activities that encourage creative thought while exercising their critical thinking skills. Throughout the museum, children interact with thoughtful, rotating art installations that require viewer interaction. After enjoying the many popular destinations in San Diego, you may be interested in considering the non-touristy things to do in San Diego, the special spots primarily enjoyed and loved by locals that barely make it on tourist itineraries. Silverwing Monument is one such location. 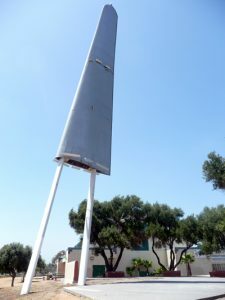 This monument, nearing 70 years old, commemorates the accomplishments of John J. Montgomery–the first man who achieved sustained flight in a winged vehicle in 1883. (Yes, even before the Wright brothers.) Fans of aviation and history fanatics should plan to visit this site towards dusk, allowing for a picnic sunset with loved ones. It’s definitely one of the more quiet things to do in San Diego, but with the silence comes tranquility. The Hipster bars in San Diego always offer a good time, but for a more social and interactive experience, don’t count out Brewery Tours of San Diego. This company offers tours through the city’s most popular and beloved local craft breweries, allowing participants to sample a variety of local brews at an affordable price. Both public and private tours are offered, depending on whether you would like to experience the tour with fellow beer enthusiasts and make acquaintances or experience the mechanics of the breweries with friends and family and forge personal memories. Tours include a meal, as well as transportation between the brewery locations. Make arrangements to return to your accommodations after the experience; you won’t want to be driving afterwards! Round out your day at Gaslamp Quarter, San Diego’s historic district where visitors can observe impressive architecture as they partake in one of California’s most vibrant nightlife destinations. 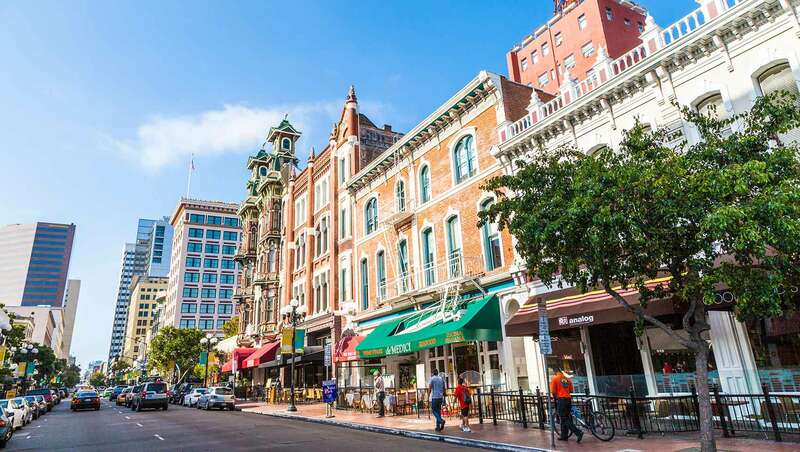 Those who stroll through Gaslamp Quarter, taking in its many upscale dining establishments and social lounges, express amazement at how well the state preserves its historic buildings and respectfully blended them into a contemporary setting. It’s the perfect destination if you’re seeking things to do in San Diego at night–though Gaslamp Quarters is a fun daytime stop as well. You’ve surely seen them in movies and pondered how they came to be–those delicate wooden bridges suspended high above the forest floor threatening to fail with each step travelled across them. While you’re visiting San Diego, you can walk across one for yourself. The Spruce Street Suspension Bridge stretches 375 ft, offering those daring to cross it an astonishing view of the canyon below. Once the initial anxiety fades, it’s a romantic spot enveloped in a green serenity only Mother Earth can offer. 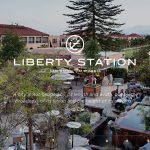 Just outside of downtown San Diego lies Harbor Island, a beautiful man-made peninsula located adjacent to San Diego Airport, a convenient destination to begin your journey. It’s one of the best things to do in downtown San Diego between activities that require more energy. It’s a prime location to watch sailboats competitively race in the afternoons or take an evening stroll with views that blend city and civilization with coastal calm–quintessential San Diego. The best kinds of museums are those that require your attention, those that linger in your mind’s eye for the days following your visit. thespruce.com The USS Midway Museum is one such museum. It’s a retired military aircraft carrier transformed into an educational experience. Walk through the ship’s many platforms observing a variety of wartime aircrafts while listening to explanatory audio tracks corresponding with the various exhibits. It’s a once-in-a-lifetime experience that forces visitors to reflect on the sacrifices of America’s servicemen while surveying the technology and history that contributed to our current hour.